The sulfur content of transportation fuels has been declining for many years as a result of increasingly stringent regulations. In the United States, federal and state regulations limit the amount of sulfur present in motor gasoline, diesel fuel, and heating oil. New international regulations limiting sulfur in fuels for ocean-going vessels, set to take effect in 2020, have further implications for both refiners and vessel operators at a time of high uncertainty in future crude oil prices, which will be a major factor in their operational decisions. Bunker fuel—the fuel typically used in large ocean-going vessels—is a mixture of petroleum-based oils. Residual oil—the long-chain hydrocarbons remaining after lighter and shorter hydrocarbon fractions such as gasoline and diesel have been separated from crude oil—currently makes up the largest component of bunker fuel. The sulfur content of crude oil tends to be more concentrated in heavier hydrocarbons, with heavier petroleum products such as residual oil having higher sulfur content than lighter ones like gasoline and diesel. The International Maritime Organization (IMO), the 171-member United Nations agency that sets standards for marine fuels, decided in October to move forward with a plan to reduce the maximum allowable levels of sulfur and other pollutants in marine fuels used on the open seas from 3.5% by weight to 0.5% by weight by 2020. 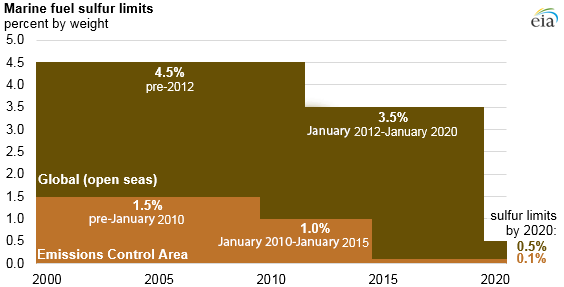 This decision follows several other marine fuel regulations limiting sulfur content, such as the implementation of Emissions Control Area (ECA) requirements in coastal waters and specific sea-lanes in North America and Europe, which limited the maximum sulfur content of fuels to 0.1% by weight starting in July 2015. The IMO sulfur limits that take effect in 2020 will affect the fuel used in the open seas, the largest portion of the approximately 3.9 million barrels per day of global marine fuel use. These limits will present several challenges for both refiners and shippers. The first challenge for refiners is to increase the supply of lower sulfur blendstocks to the bunker fuel market. Refiners have several potential paths. 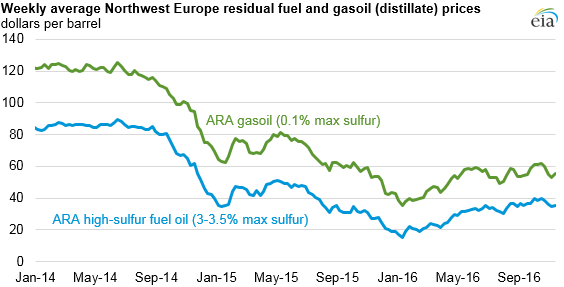 One approach is to divert more low-sulfur distillates into the bunker fuel market. Another option is to use low-sulfur intermediate refinery feedstocks in bunker blends. A second challenge for refiners is deciding what to do with the high-sulfur residual oil that can no longer be blended into bunker fuel. Adding capacity to desulfurize residual oil is one option, but the economics to do so are not currently attractive to refiners. An alternative strategy is to build or expand refinery units that take heavy hydrocarbons and upgrade them into lighter, more valuable products. In either of these cases, refineries would be faced with investments and costs that are acceptable only if there is certainty of future demand from the shipping industry. Vessel operators also have several choices for compliance with the new IMO sulfur limits. For example, IMO regulations allow for the installation of scrubbers, which remove pollutants from ships' exhaust, allowing them to continue to use higher sulfur fuels. Some ship owners that operate primarily in coastal areas, such as cruise lines and ferries, opted to install scrubbers on their vessels as the new ECA regulations came into force. The possibility of widespread scrubber installations, which would allow ships to continue to use higher sulfur residual oils, could make refiners hesitant about making large investments to build refining units capable of upgrading the residual oils. Ships also have the option of switching to new lower sulfur blends or to nonpetroleum-based fuels. Some newer ships can use liquefied natural gas (LNG) rather than petroleum-based products. However, the infrastructure to support the use of LNG as a shipping fuel is currently limited in both scale and availability.